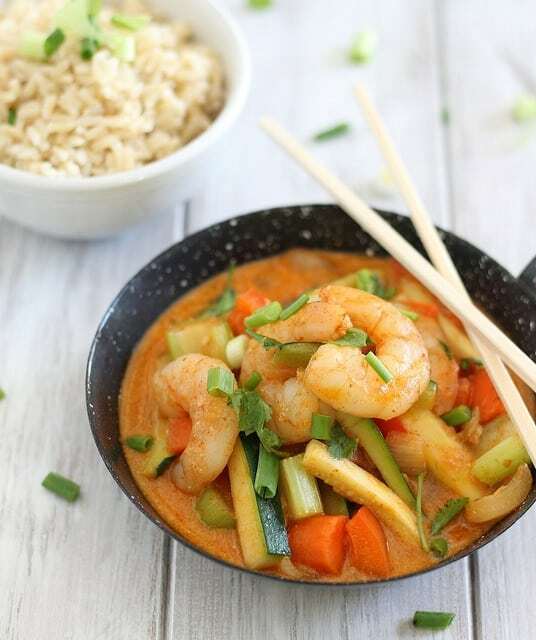 This is an easy, 15 minute coconut red curry shrimp recipe. Perfect for a quick dinner. 2. rush home from Crossfit to be able to make dinner and photograph it in natural light. 3. eat dinner at 5pm like senior citizens in the winter to accomplish #2. 4. buy a 1 serving wok/skillet thingy at a thrift store in California that can’t actually be used on the stove. 5. walk into the local sushi place and ask for a pair of chopsticks without even eating there and walk out. 7. make a damn good red curry. Staring at the pictures in this post made me laugh at how many ridiculous things I did in order for them to appear in this post as they do. And then I had to laugh some more because I literally just got back from purchasing sticky tiles and 4 random slate pieces for new photo backgrounds from home depot an hour before writing this. What has my life come to? Seriously. 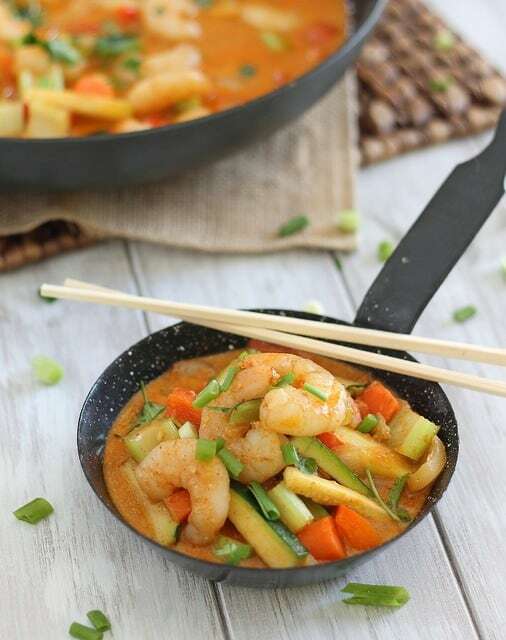 An easy 15 minute red curry shrimp recipe with the perfect balance of creamy coconut and spice. In a large skillet or wok over medium-high heat, melt coconut oil. Add all vegetables and saute for another 5 minutes until softened. Add shrimp and then curry paste and toss to thoroughly coat all the vegetables and shrimp with the paste. Saute for another minute. Add the red pepper flakes, fish sauce and coconut milk and cook until shrimp are cooked through, about 3-5 more minutes. Garnish with cilantro or scallions and serve with rice. You are so funny!!! When my Step-daughter goes to Panda Express, I always ask her to bring home extra chopsticks. That reminds me I need more! What a wonderful dish! All i can say is, I’m glad I’m not the only one. My hubby gets so pissed at me after I make dinner because while he’s eating, I’m photographing the hell out of my food and it’s getting cold. I swear it’s worth it though, damn it! I stand by you. United we bloggers stand. I really need to learn to style my food better! Your pictures always look so pretty and of course, this looks delicious too. hahahhhahha i love it. ;) this is why I rarely post any recipes in the winter time….there is NO way that I can do all that with a sticky-fingered little toddler hanging off me and considering I don’t even get home most dasy until 530-545 (after sun set). Ha, love it! I need to take some food styling tips from you. P.S. The Shrimp Curry will be on my dinner table soon! Hi! Love this, and intend to make it. One question: did you use light coconut milk for any particular reason? I already have full-fat coconut milk in the pantry and prefer a thicker curry, also. Oh, I love me some thick curry. Full-fat coconut milk, here I come! I am pretty sure after I read them, I promptly email at least half your recipes to my sister. This looks delicious. hahahaha OMG there needs to be a LOVE button on this post because it is sooooo true!! everything you pointed out! This is a great post! Had me laughing out loud. I am a total foodie but I have a lot to learn in the photography department. HA! I love your list of crazy things food bloggers do! I totally know what you mean! I’ve filled glasses with watered down half and half to be “milk” when I didn’t have any. 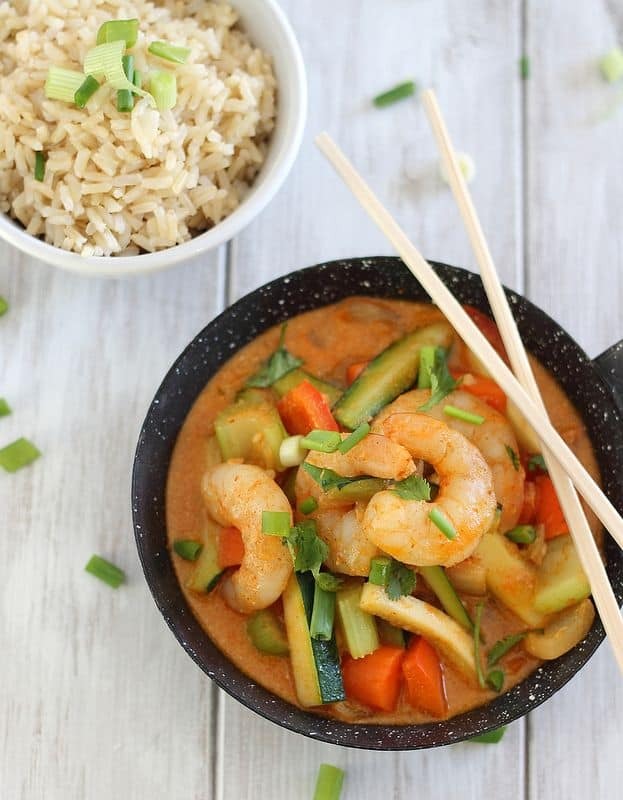 On another note- I adore red curry and this looks wonderful! This is hilarious, Gina and every line is totally true. Love the curry! Pretty new to reading your blog, but just wanted to say hi and that you’re so funny, which you probably get all the time……….. or not, idk, i guess it depends on people’s tolerance for sarcasm without an ounce of peppiness (for which mine is pretty damn high). Cheers! I was thinking about photographing my dinners. Changing my mind because I’m already the last one to the table. I’ll miss dinner convo w/ my fan completely. Ha! Making this tonight since I have all the goods to go in the dish!!!!! Thanks!!!!! Love your blog!!!!! Your super witty. Pingback: The Magic of Coconut Milk: 10 Sweet and Savory Recipes | Everyfoodrecipes, cooking tips, and how-to food videos—all rated and reviewed by millions of home cooks,make the perfect birthday cake, or plan your next holiday dinner. Okay, so I don’t typically comment on these things (lurking and swiping recipes is more my style) but this time I just had to. I-don’t-like-curry-I-don’t-like-ginger hubby and I just finished having this for dinner – no really, my laptop is on one counter (where I had it for easy recipe viewing) and I’m hopping back and forth between it and the sink full of dishes right now – and it was amazing. His exact words, “This may be one of your best meals yet,” and my favorite, “This is like, restaurant quality.” This is the same man who not only ‘doesn’t like’ curry or ginger but also made ridiculous faces all last weekend at the grocery store while we were buying ‘weird’ ingredients like coconut oil (yes, I’ll admit it, this is not something I use on a regular basis – my pantry basically just consists of every variety of olive oil known to man, even when a recipe calls for vegetable or canola oil, unless it’s baking, I just sup the extra light olive oil), curry paste, and fish sauce. We. Loved. It. I jumped on this recipe as soon as I came across it (thank you Pinterest) because a few weeks ago we were in D.C. and I had a salmon curry at a little wine bistro across from Ford’s theater that I loved and was hoping this would be similar. I was not the least bit disappointed. The only differences are that yours has a lot more veggies (which is a super-ultra-plus in our house), the bistro’s had pineapple (which I will probably add next time I make yours, just to see how it comes out – any suggestions on when I should throw it in there? ), and theirs was thicker (and I just saw your comment to another poster that full-fat coconut milk would make it thicker – a possibility I threw out to hubby as we were eating). But you should know that those are not criticisms in any way – again, yours was awesome. It will definitely go into the rotation for “We feel like splurging on the grocery bill and buying shrimp this week” recipes. Yay! So glad everyone liked it. Compliments from picky husbands are the best kind :) If you add the pineapple (and I think that sounds like a great idea!) I’d just throw it in with the shrimp so it has a chance to warm through. I made this yesterday for dinner. It was DELICIOUS!!! We loved it. I can’t wait to have the leftovers. It was easy and I will make this again and again. A few notes from my personal experience. First, it takes a lot longer than 20 minutes to make this meal when you factor in getting all the ingredients out, making the rice, cleaning, de-seeding, chopping vegetables, grating fresh ginger measuring sauces, and cooking. I used frozen de-veined shrimp, so I was saved that chore. I think it took me about an hour. Next, it took about double the coconut oil to properly saute the vegetables. I added snow peas (not in recipe) after cooking the other vegetables for six or seven minutes. I also used full fat coconut milk. Next time I would double the vegetables or half the shrimp; I’d add a tad more curry paste and a about another 1/8 teaspoon red pepper flakes. Again, it was DELICIOUS — I’d just like a tiny bit more heat. Thank you very much for posting the recipe — it is definitely one I will use over and over again. I greatly appreciate you posting this recipe, but I found it to be rather bland. I didn’t make any changes and followed it as listed, but the flavors never seemed to fully develop and it felt as though something was definitely missing. The color of the sauce was gorgeous – I just wish it tasted as vibrant as it looked.